SPOILER ALERT!! – A derailed attempt by the Lucian Alliance to seize control of Destiny culminates in hostages and casualties on both sides. With a tense standoff between Colonel Young (Louis Ferreira) and his brutal adversary, Commander Kiva (Rhona Mitra), the Destiny starts having ship wide power black outs. To make matters worse, Dr. Rush (Robert Carlyle) concludes that these power fluctuations are being caused by deadly bursts of radiation from a binary pulsar that will in a short while cause the shields to fail and kill all aboard the ship. 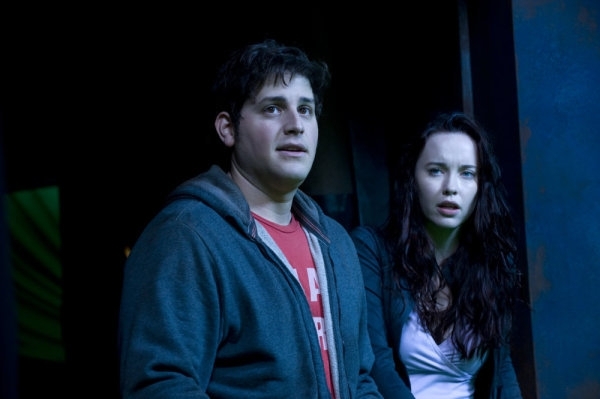 While the standoff plays out, Eli (David Blue) helps an injured Chloe (Elyse Levesque) as they try to make their way back from a remote section of the ship. Incursion: Part 2 airs Friday, June 11th @ 9:00 p.m. EST/PST on the Syfy Channel. As noted above, photos by Carole Segal and copyright of the Syfy Channel, so please no unauthorized copying or duplicating of any kind. Thanks! SPOILER ALERT!! – Both Dr. Nicholas Rush (Robert Carlyle) and Chloe (Elyse Levesque) are plagued by nightmares following their imprisonment on the alien ship. Rush is worried that a tracking device may be hidden somewhere aboard the Destiny. 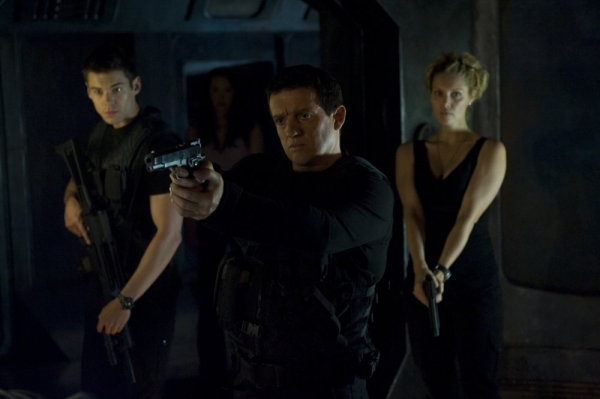 Suspecting he may be right, Colonel Young (Louis Ferreira) and Lt. Scott (Brian J. Smith) conduct a search of the ship’s hull. While distracted by the search, a group aboard the Destiny puts into action a coup that has life-threatening consequences. Divided airs Friday, April 9th @ 9:00 p.m. EST/PST on the Syfy Channel. As noted above, all photos by Carole Segal and copyright of the Syfy Channel, so please no unauthorized copying or duplicating of any kind. Thanks! SPOILER ALERT!! – Everyone is shocked when a member of the crew is found dead from a gunshot wound. While at first glance it appears to be suicide, the gun is nowhere to be found. The crew is confined to quarters while a search is performed and when the gun shows up in Colonel Young’s (Louis Ferreira) quarters, he becomes the number one suspect. Fearing a mob scene, Young agrees to a trial and cedes command to Camile Wray (Ming-Na). Dr. 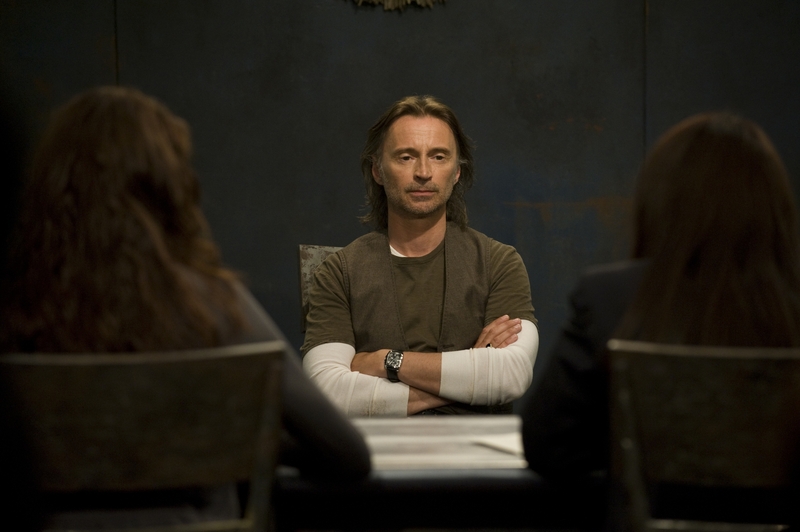 Rush (Robert Carlyle) convinces Wray to give him control of the science team and carte blanche with the new Ancients interface, previously kept under guard. But before Rush can unlock its secret, or Young’s trial can conclude, both are needed to explore a planet hiding a secret that threatens the Destiny and her crew. Stargate Universe’s Mid-Season Finale, Justice, airs Friday, December 4th @ 9:00 p.m. EST on The Syfy Channel. As noted above, all photos by Carole Segal or Eile Schroter and copyright of The Syfy Channel, so please no unauthorized copying or duplicating of any kind. Thanks! SPOILER ALERT!! – Using the communication stones, Lt. Scott (Brian J. Smith) and Camile Wray (Ming-Na) use their time back on Earth to visit those they left behind. Camile returns home to spend time with her partner Sharon (Reiko Aylesworth), trying her best to make the strange circumstances normal. Meanwhile, Lt. Scott learns a past relationship might not have ended as he thought. Aboard Destiny, Dr. Rush (Robert Carlyle) supervises the exploration of new areas of the ship. Looking for resources to make their everyday lives easier, the crew stumbles upon a piece of Ancients technology that carries the promise of a way home. While somewhat familiar with the find, Dr. Rush cannot guarantee the safety of using it, bringing him and Colonel Young (Louise Ferreira) to a standoff on what to do. Life airs Friday, November 20th @ 9 p.m. EST on The Syfy Channel. SPOILER ALERT!! – With the situation onboard the Destiny dire, General O’Neill (Richard Dean Anderson) and Home World Command orders Colonel Young (Louis Ferreira) to execute a high risk plan by the IOA (International Oversight Authority) scientists which, in theory, could return the crew to Earth. The colonel tries to buy more time so that he can consult those on the ship whose lives are at stake. 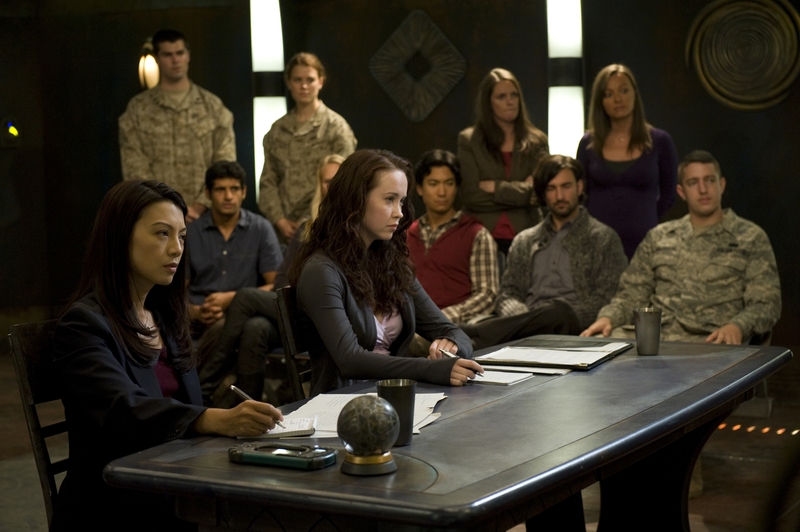 While using the communications stones, Camile Wray (Ming-Na) is approached by IOA representative Dale Strom (Carlo Rota), who suggests that she steer opinion on the ship in favor of the plan. Eli (David Blue) and Chloe (Elyse Levesque) are allowed to use the communications stones to visit Earth and their loved ones for what may be the last time. Their homecoming is not what they expected and the two try to drink away their worries at a club (featuring Janelle Monae), but are unable to ignore the looming fate of the Destiny that they have left behind. Earth airs Friday,November 6th @ 9 p.m. on The Syfy Channel. SPOILER ALERT!! – Despite severe rationing and around the clock security, the water reserves onboard the Destiny continue to drop. Dr. Nicholas Rush (Robert Carlyle) has no explanation for this latest setback but, if they are to survive, they must find a new water source soon. The only planet within range is a frozen wasteland surrounded by a thin and poisonous atmosphere. Donning two of the ship’s deteriorated spacesuits, Colonel Young (Louis Ferreira) and Lt. Scott (Brian J. Smith) head to the planet’s surface hoping to retrieve enough ice to replenish their water supply. Once there, however, tests reveal that the ice near the Stargate contains traces of highly toxic chemicals. Young and Scott take off in search of drinkable samples, knowing they don’t have long before their air runs out and Destiny jumps back into FTL (faster-than-light) drive. Back onboard the ship, Lt. Johansen (Alaina Huffman) works with the crew to catch an intruder who they believe is responsible for the lost water rations. Water airs Friday, October 30th @ 9 p.m. EST on The Syfy Channel. SPOILER ALERT!! – The Destiny is still without power and an attempt to alter its collision course with a star has failed. The situation is now critical. A plan is born to abandon ship using the last working shuttle, with the hope that one of the three planets in close proximity will be habitable. Although this strategy initially raises the crew’s spirits, it is short-lived when Colonel Young (Louis Ferreira) announces there is only room for 17 people, and a lottery will determine who goes and who stays. Stunned by the implication of this news, everyone considers their fate. Some, including Dr. Rush (Robert Carlyle) and Colonel Young, opt to stay onboard. Others, determined to survive, vie for a seat on the departing shuttlecraft. In the short time that remains, alliances are forged and others damaged while Eli (David Blue) tries to create a message in a bottle with the aid of a Kino. But, unbeknownst to all, forces are at work that no one could have foreseen. Light airs Friday, October 23rd @ 9 p.m. EST on The Syfy Channel. SPOILER ALERT!! 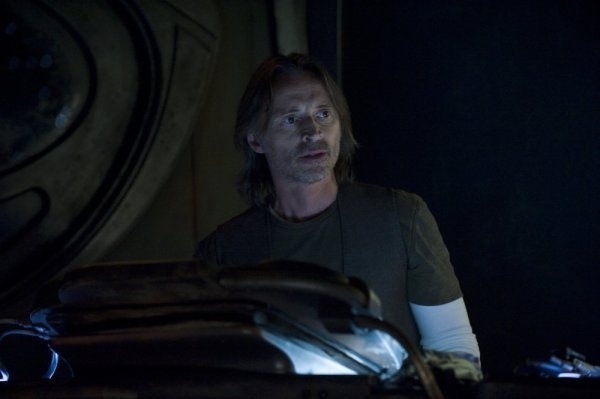 – Dr. Nicholas Rush (Robert Carlyle) has been working throughout the night to try to determine why the ship’s power reserves are critically low. He reiterates his mounting concerns to Colonel Young (Louis Ferreira), who advises the crew to limit their power consumption to essential services only. Suddenly, the lights dim to emergency levels and everything but life support goes dead. Overwhelmed by fatigue and frustration, Rush declares that all onboard will perish within days. But when Destiny’s flight path towards a solar system reveals the existence of three planets, they hope that one of them is habitable. Darkness airs Friday, October 16th @ 9 p.m. EST on The Syfy Channel. SPOILER ALERT!! – With the air supply failing on the Destiny, a team gates to a desert-like planet in Air: Part 2 to search for the mineral needed to scrub the ship’s air of carbon dioxide. After testing numerous sand samples without success, and with their window of opportunity closing fast, the group opts to split into two to cover more ground, despite the unbearable heat. While one team presses on to find the treasured mineral, the other has another goal in mind. When it is apparent that Dr. 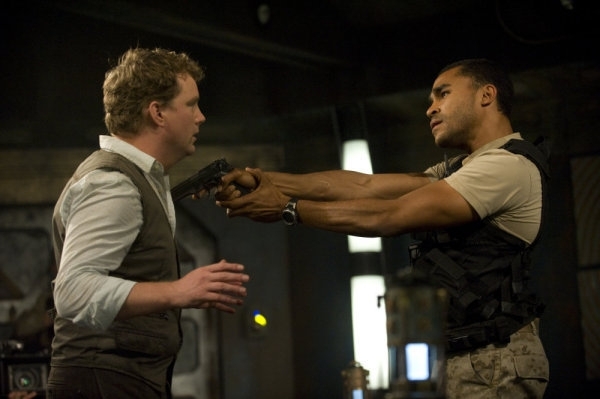 Rush (Robert Carlyle) can’t go on, Lt. Scott (Brian J. Smith) decides to go it alone and orders Sergeant Greer (Jamil Walker Smith) to return to safety with the exhausted scientist. Meanwhile, with life on the ship looking bleak, and with the aid of the communication stones, Colonel Young (Louis Ferreira) reports in to General O’Neill (Richard Dean Anderson) and Chloe (Elyse Levesque) has one last chance to see her mother. Air: Part 2 airs Friday night, October 9th @ 9 p.m. EST on The Syfy Channel.